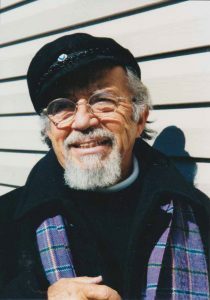 Marvin Levitt, a familiar face in the art scene on Long Beach Island, has been a teacher, colleague, and friend to many artists. He is easily recognizable by his neighbors in Loveladies. Marvin came to LBI to work and study with his friend and mentor Dr. Boris Blai. Dr.Blai was a world-renowned sculptor, one of the few trained by Rodin. He loved the Island and had a house on the ocean in Harvey Cedars. Wanting the Island to have a community cultural center, Dr. Blai founded the Long Beach Island Foundation for the Arts and Sciences (LBIF) in 1948. In the 1950s after spending a wonderful day with his family on the beach, Marvin knew he had to get a summer job on the Island. During the regular school year, he taught art in the public schools and in 1957 he started teaching during the summers at LBIF. He finally stopped teaching there in 2011; that nice summer job had a 54-year run! Marvin created a scene of the Loveladies area back in the ‘50s and ‘60s. Maybe there were two or three streets with one house on each street. You could easily see the lighthouse, and the pine trees had not yet been provided by the Boy Scouts. 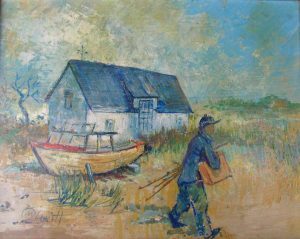 Artists who came to work with Dr. Blai stayed in garages or lived in Loveladies Harbor. It was as much a musicians’ retreat as an artist colony. Members of the Philadelphia orchestra and symphony would escape the city to come and stay at the beach. Since it was such a small community, everyone knew one another. Pot luck dinners included the bounty of the ocean, great conversations, children running around and occasionally a string quartet or brass quintet. As Marvin said, “they made their own entertainment back then.” Maybe he meant that literally since he did make some bamboo flutes for members of the orchestra. Bob had a frame shop in NYC. Marvin told the tale of Bob and him being upstairs at the shop making soup. When Bob’s wife called up and insisted that he come down, he said that he was busy making soup and couldn’t leave it. Eventually, he grudgingly went downstairs to find artist Marc Chagall was there to commission framing for 35 foot panels for the Metropolitan Opera House! Bob and Marvin took their soup and their seafood seriously. The two artists used to fish for blowfish that were plentiful but a pain to filet. Basically you would nail the head down and turn the fish inside out. 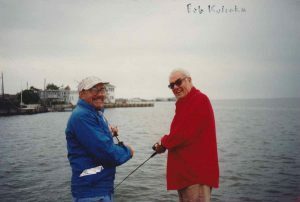 After catching enough fish for the weekend crowd, they returned to Bob’s house in Bay Terrace. Once, when they were starting to prepare the fish, one of the guests announced that he was going to cook it. A little annoyed, Bob asked his wife who this would-be chef was, to which she replied, “James.” He then persisted asking, “James who?” When she answered “Just James Beard” the argument ended. James did his magic and named the dish “Swell Fish Provençale.” This was the norm for the Island. You never knew who you’d run into or would join you for dinner! Not all of Marvin’s adventures involved food, though. They also included art. To quote Marvin: “There is art in everything!” Sometimes it just takes an artist’s eye to see the potential. After the Great Atlantic Storm of 1962, all types of debris were washed into the bay. Residents worked to clear out what they could. They cleared junk out of the bay and pulled out the post office boxes from the Harvey Cedar Post Office. The post office (formerly at Mr. Monk’s behind the Neptune Market) was destroyed in the storm and workers did not want the boxes back. Marvin cleaned up the boxes and put one in his dining room, making it a perfect place to store bottles of wine. 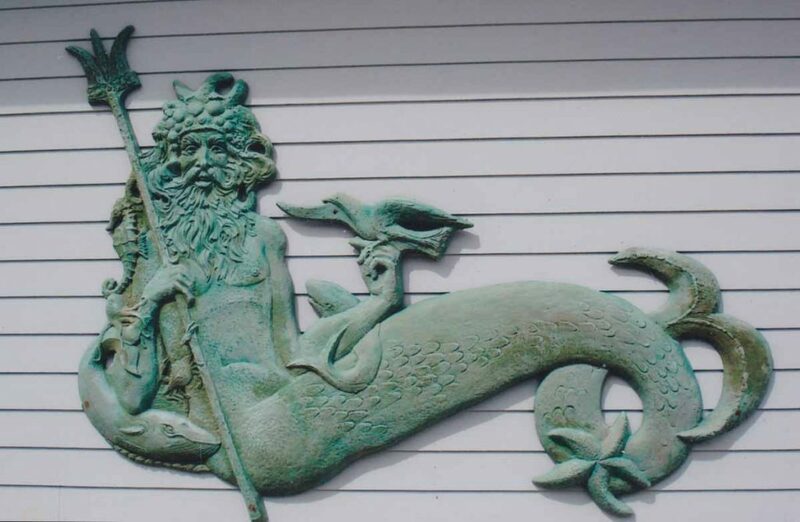 Many people may be familiar with at least one piece of Marvin’s art: King Neptune that graced the Neptune Liquor Store for many years. When the store was sold, the owner couldn’t bring himself to leave King Neptune there so he took him home. Eventually the King was donated to LBIF. It can be seen gracing the outside of the marine science building. The King even has some new mosaic waves to swim in!